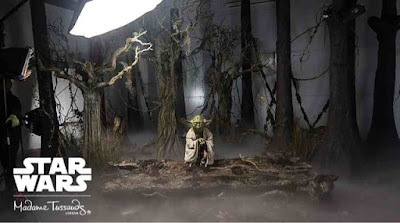 DeathStarPlans.com: Madame Tussauds London is strong with the Force! Madame Tussauds London is strong with the Force! The Midichlorian count in these wax statues rival even Master Yoda! Now open at Madame Tussauds London Wax Museum, you can travel to the Galaxy far, far away and get up close and personal with 16 of the most iconic and legendary characters from the Star Wars franchise as they are immortalized in wax! You can visit Dagobah and meet Yoda the Jedi Master, Jump into hyperspace with Chewbacca on board the Millennium Falcon, or head to Tatooine and barter with crime lord Jabba the Hutt for the release of Han Solo! If you plan on attending Star Wars Celebration Europe, which is being held at the Excel London Exhibition Centre on July 15-17, 2016, this would be the perfect addition to your trip!